Road Avenger (also known as Road Blaster FX) is a Full Motion Video (FMV) arcade game. The game consists of nine stages and it revolves around quick-time events so you don't control your car in the usual sense. Essentially you're watching a movie and your job is to press the button displayed on screen at the correct time. It sounds boring but it's anything but. The action is non-stop and incredibly hectic meaning you'll struggle to find time to blink. Every stage is a white knuckle ride and it's a rush blazing along at high speed while carnage is going on around you! The video is choppy, probably due to the compression that needed to be done in order for it to work on the system. As a result it can be difficult to tell what's going on in the cut-scenes as well as in hectic stages near the end of the game. The graphics still look good though and despite the compression artefacts there's barely any pixelation. 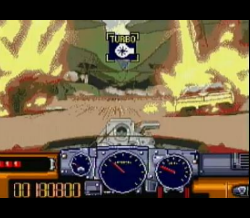 The video even takes up the majority of the screen which is uncommon for an FMV title on the Mega CD. The gameplay is generally forgiving so if you accidentally press the wrong button you'll still have plenty of time to correct your mistake. In the last two stages you only have a split second to make the right choice and there are parts that require memorisation rather than straight-up reactions. The in-game music is barely audible and I honestly couldn't tell you what each track sounds like. The developers purposely lowered the BMG volume so you can hear the different audible notes that tell you whether to press the Brake or Turbo button. You can use the visual aids on screen but I found that reaction times are much better when listening for audio clues. Road Avenger is a standout gem in the Mega CD library - the idea of an entire game based around quick-time events might sound dull but give this one a try and you'll be surprised how intense and engaging it actually is. Random trivia: The director of Road Avenger also worked on the arcade version of Double Dragon. The keen eye among you might notice that the famous intro to Double Dragon features the same red sports car in the background!